Ever since trying the Hello brand of toothpastes back in December, I have been hooked. My entire family uses all their flavors and loves them (especially the kids). I was so excited to see that they recently launched a sensitivity relief fluoride toothpaste, because unfortunately I haven’t always been the best when it comes to brushing my teeth. Motherhood has a way of making you forget basic grooming. I started using the sensitivity relief fluoride toothpaste as soon as I received them in the mail. My teeth can be extremely sensitive and there have been countless times when I’ve cringed at the thought of brushing. When I started using this toothpaste I noticed a change immediately. It relieves sensitivity pain, gently whitens teeth, and it contains moisturizing coconut oil and soothing aloe vera to help prevent cavities and strengthen enamel. We all know that brushing is important but so is the toothpaste you’re brushing with. I’ve become more conscious about what my family eats but I need to be better about choosing products that go into our body and on our skin. 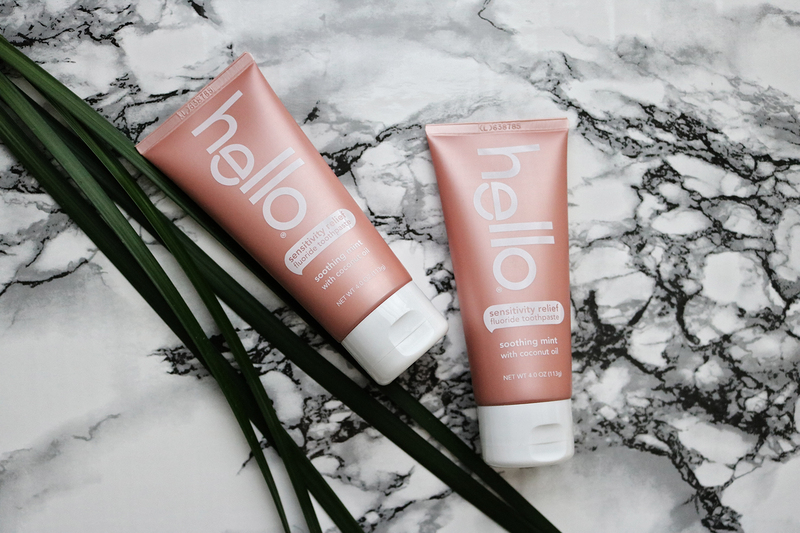 I love that Hello Products are vegan, made in the USA, free of dyes, artificial sweeteners, and preservatives. They are also gluten free and never, ever tested on animals. If there was an award for the best toothpaste, this would win with flying colors. It tastes amazing and I would know, because I’ve tested each flavor. Next time you’re at Target (because I know you’re there weekly) be sure to pick up some of the new sensitivity relief fluoride toothpaste to try. If Target isn’t your mothership, then you can also buy at Walmart and Amazon. Let me know in the comments below if you’ve tried Hello toothpaste before and what your favorite flavor is! This post was sponsored by Hello Products. As always, all opinions are my own. We love Hello toothpaste! I’ll have to look for this one when we run out! I need to try this! My teeth have been so sensitive lately! I need this it sounds amazing! I NEED! My teeth hurt all of the time they’re so sensitive. Picking this up! Thanks for sharing! I’ve never heard of it! I’ll have to try it! I’ve been considering looking for a toothpaste for sensitive teeth… I think that mine is caused by my recent coffee addiction, and I’m not a fan of the sensitivity! I haven’t heard of this brand before, but it sounds really nice! Sounds like this would be perfect for my sensitive teeth. Definitely going to be on the lookout for it next time I go shopping. My teeth I think are sensitive I’ve tried other whiteners and it made them hurt.I wanna try the kids kind since its fluoride free and watermelon. yum! Ohhh trying! My teeth are soooo sensitive! I need to try this! I have sensitive teeth! I just found this brand for Parker. She loves the bubblegum flavor. I’ll have to check this out for myself.